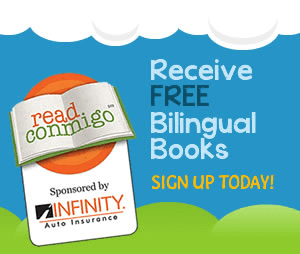 Get FREE Bilingual Children’s Books from Read Conmigo! Read Conmigo is a bilingual literacy program that provides free children’s books in English and Spanish, educational apps, and literary resources for children in preschool through 5th grade. The program is completely free. To access our online book library and educational apps, click Books on the top menu. All eBooks are compatible with most Apple iOS, Amazon Kindle, and Android devices as well as laptop and desktop computers. Teachers – Receive a packet of books for your classroom* as well as other teaching materials.